One of the most fun and joyful celebrations on the lunar calendar, the Chinese Lantern Festival is celebrated on the last day of the Chinese New Year observance. This year, the Chinese Lantern Festival will be observed on Tuesday, February 19, 2019. For thousands of years, the lantern festival has been celebrated each year to mark the return of better days -- as spring moves forward and winter retreats! And what better reason to celebrate? Observed on the 15 day of the first month on the lunar calendar, the lantern festival coincides with the full moon -- as bright lanterns answer the call for even more light to dispel the winter darkness. Besides the hanging of lanterns (from homes, shops, and streets), other festivities include fireworks, the telling of riddles, displays of colorful folk dances, and the eager consumption of traditional sweet treats. Solving riddles are one of the oldest traditions of the festival. Riddles are written on pieces of paper and hung from lanterns so visitors may attempt to solve them. Guess the correct answer ... and you may win a prize! A Western version of a lantern riddle might be, for example: "What runs around the house but doesn't move?"" (Answer: a fence.) 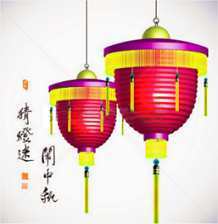 But since lantern riddles often include subtle changes of meaning in the Chinese alphabet, they can be hard to solve. In fact, some such lanterns are called "tiger lanterns" for their ferocious difficulty. Suffice to say that the spirit of holiday lantern riddles is the use of clever wordplay that amounts to a fun and festive party game. Another much-beloved tradition of the holiday is Lantern Festival FOOD! And, none is more anticipated than the customary servings of yuanxiao dumplings. Depending on the filling, yuanxaio dumplings can be made as a dinner course, or as a sweet dessert. 1. In a small skillet, toast the sesame seeds over a low flame for 2-3 minutes, stirring constantly so that sesame seeds don't burn. 2. In a food processor, add the ground sesame seeds and walnuts and grind to the consistency of fine sand. 3. Mix walnut and sesame seed mixture with sugar and vegetable shortening until thoroughly blended. 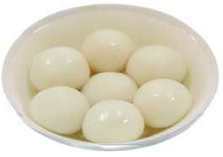 Mix in 1-2 tablespoons of water so that the mixture is moist enough to form small balls. 4. Coat a large cookie sheet, with a 1/4 inch layer of glutinous rice flour. Roll the filling into little balls, about ½ inch in diameter, and place them on the tray. Roll the balls around on the cookie sheet to completely cover them in flour. 5. Remove balls to a second cookie sheet, and sprinkle them with water until thoroughly moistened. Spread more glutinous rice flour on the first cookie sheet, and repeat the rolling and moistening process until all of the rice flour is used up. with each coating the balls will be became larger in a snow ball effect. 7. To serve, place four or more dumplings into a small bowl and add extra spoonfuls of the cooking liquid. Folk dances and street parades are customary street entertainment during many holidays and festivals in China throughout the year - and the Lantern festival is no different! The lion dance and the dragon dance each has its symbolic meaning -- to lend courage, and good luck to the community in which they are performed. They also provide a spectacular entertainment and add great fun to the festivities. Stilt walking, especially in Northern China, is another street spectacle that can be seen during the Lantern festival, and performed in a style that may range from gentle and graceful to high-energy acrobatics. And what celebration would be complete without fireworks? With lanterns lining the streets and a bright, full moon high up in the sky, a spectacular fireworks display is usually the big finale to the Lantern festival that surely heralds good times ahead. • The Lantern Festival was under threat of being totally ignored in China during the mid-20th century. That is, except for groups of school children who continued to parade lanterns throughout the streets. Who could resist? The heartwarming display helped to revive the tradition that continues to this day. • Today, the Taipei Lantern Festival is the world's largest, attended by thousands each year in a week-long celebration. • Since it is the first big public social occasion of the year, (and the full moon helps) the Lantern Festival is also known in some parts of the country as Chinese Valentine's Day. Lantern Festival - Wikipedia - Learn more about the annual festival including its origins and modern-day celebrations with photos, related references and resources.